Johns Hopkins Bloomberg School of Public Health, Center for Communication Programs, Baltimore, MD, USA. Tropical Health LLP, Montagut, Girona, Spain. Women of reproductive age are generally more likely to sleep under an insecticide-treated net (ITN) than other household members. Universal coverage increases ITN use by all family members, including pregnant women. However, BCC efforts are needed to achieve desired levels of bed net use, which is especially important for pregnant women. Background: Malaria in pregnancy is a major public health concern, contributing to roughly 11% of neonatal deaths and to 25% of all maternal deaths in some parts of the world. The World Health Organization has recommended priority interventions for malaria during pregnancy, including use of insecticide-treated nets (ITNs), but net distribution has shifted recently to a universal coverage paradigm rather than one targeting vulnerable populations. Methods: To determine whether and to what extent pregnant women are prioritized within the household for ITN use, we assessed national survey data from 2009–2013 in 10 African countries. Proportion of pregnant women who slept under an ITN the previous night and 95% confidence intervals were calculated and compared between countries. 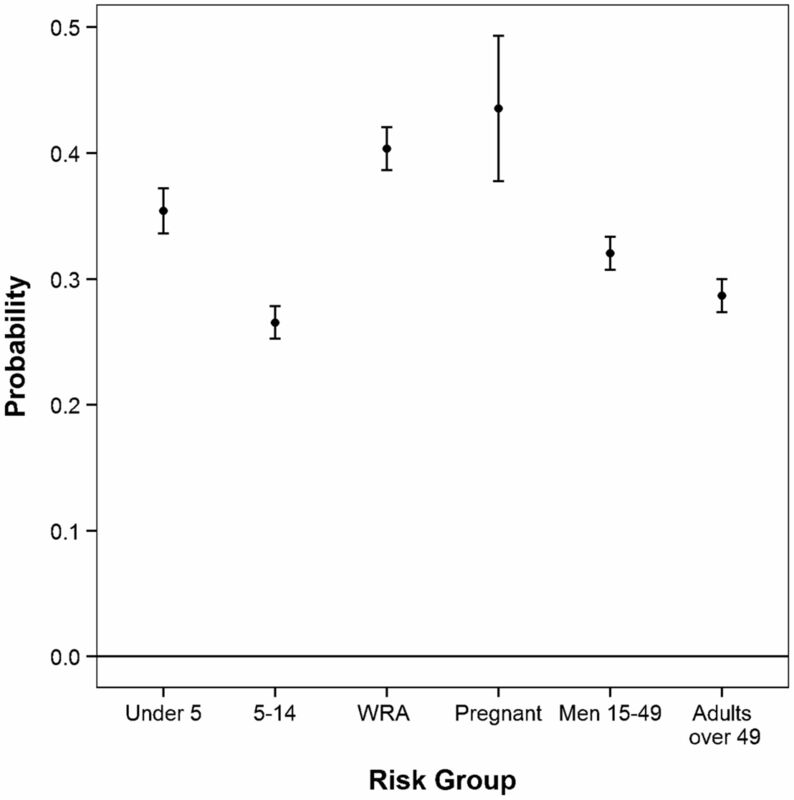 Within-country logistic regression examined whether pregnancy was significantly associated with ITN use the previous night compared with other risk groups, and the predicted probability of net use for each risk group was calculated holding other covariates constant. Results: A median 58% of households reported owning at least 1 ITN. On average, across all 10 countries, 35% of pregnant women in households with at least 1 ITN used a net. Households with universal coverage (at least 1 ITN per 2 people) had higher levels of net use among all family members; for example, 79% of pregnant women, on average, used a net in such households. In all countries, the predicted probability of ITN use by pregnant women was significantly higher than the probability of net use by most other household members except non-pregnant women of reproductive age. Conclusion: These findings suggest that both pregnant women and non-pregnant women of reproductive age are being prioritized within the household for net use. However, behavior change communication strategies are needed to achieve ITN use goals for pregnant women. Malaria infection during pregnancy contributes to 25% of all maternal deaths in some parts of the world. Because of the significant impact of this disease on pregnant women and newborns, in 2000, multiple African countries south of the Sahara pledged to fight malaria in pregnancy with insecticide-treated nets (ITNs), intermittent preventive treatment of malaria in pregnancy (IPTp), and improved case management.4 Three years later, the World Health Organization released “A Strategic Framework for Malaria Prevention and Control During Pregnancy in the African Region” to develop a standardized method for preventing and controlling malaria during pregnancy.5 By 2007, 39 African countries had incorporated part, or all, of this framework into their national malaria control plans.6 However, the extent to which these new strategies have been deployed or have reduced maternal malaria is uncertain. Since 2009, there has been a move away from prioritizing vulnerable populations (such as children under 5 and pregnant women) during net distribution to a universal coverage paradigm.15 These campaigns strive to provide every household with 1 net per 2 people, or 1 net per sleeping space, regardless of household composition (that is, number of pregnant women and children). This strategy allows countries to rapidly attain high levels of net coverage throughout a region and includes households that do not have a pregnant woman or young children; however, in order to maintain protection across the population, there needs to be additional, focused distribution targeting pregnant women and children to ensure ITN coverage at critical fetal and infant growth stages.16 Within the context of universal coverage campaigns, it is unclear whether pregnant women continue to be prioritized for ITN use, in terms of nets allocated at the national level that are specifically targeted for ANC distribution as well as net allocation within the household. In this article, we focus on assessing available survey data from 10 countries in Africa to determine whether and to what extent pregnant women are prioritized within the household for ITN use. By applying the newly recommended indicators of access to an ITN within the household to this group, it is possible to see more precisely where pregnant women are using nets.17 These data provide a better understanding of net use behavior, differentiating between those who do not use a net because they do not have access to one versus those who have access to a net and do not use one for behavioral reasons. We analyzed recent Demographic and Health Surveys (DHS) and Malaria Indicator Surveys (MIS) collected in 2009 or later from 10 African countries (Table 1). Criteria for selection of the datasets included availability of data on individual ITN use and whether there were any pregnant women on the day of the survey within the household. The most recent publicly available dataset from each country was chosen; 9 of 10 datasets were from 2010–2013, to reflect recent scale up of coverage of long-lasting insecticidal nets (LLINs). All datasets were obtained with permission from MEASURE DHS. Analyses were completed using R: A Language and Environment for Statistical Computing, version 3.0.2 (R Foundation for Statistical Computing, Vienna, Austria), and Stata Statistical Software: Release 13 (StataCorp LP, College Station, TX). Proportion of pregnant women who slept under an ITN the previous night and 95% confidence intervals were calculated and compared between countries. 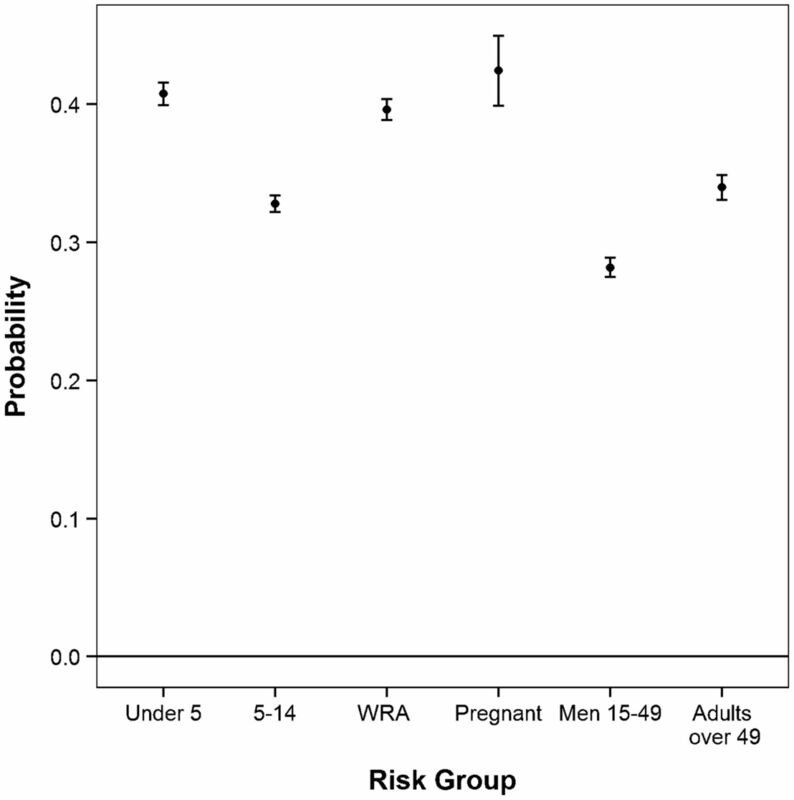 We used within-country logistic regression to examine whether pregnancy was significantly associated with ITN use the previous night when compared with other risk groups, including children under 5, children 5–14 years old, non-pregnant women of reproductive age (WRA), men ages 15–49 years, and adults over 49 years old. This analysis was restricted to those households that reported owning at least 1 ITN (referred to here as partial household coverage). Additional indicators used for analysis were developed by the Roll Back Malaria (RBM) Monitoring and Evaluation Reference Group,17 which included the “proportion of households with at least 1 ITN for every 2 people” to act as a measure for sufficient nets within the household so that every member could have used a net (referred to as universal household coverage). The outcome variable was individual ITN use the prior night (yes/no), and P values < .05 were considered significant. Following regression, the predicted probability of net use for each risk group was calculated, holding other covariates constant at their observed value. The number of households surveyed ranged from 5,895 (Nigeria) to 24,825 (Malawi). The median proportion of those surveyed who were pregnant was 9%, ranging from 7% (Madagascar and Rwanda) to 11% (Nigeria) (Table 1). The median proportion of households reporting ownership of at least 1 ITN was 58%. This proportion varied widely by country, from 30% in Zimbabwe to 92% in Tanzania (Table 1). Universal net coverage (at least 1 ITN per 2 people) was lower, ranging from 9% in Liberia and Zimbabwe to 33% in Rwanda. Proportion of net use by pregnant women varied widely by country. Among households with partial net coverage, the proportion ranged from 5.5% in Zimbabwe to 60% in Rwanda. Households with universal net coverage had higher net use; the proportion of net use by pregnant women in these households ranged from 53% in Zimbabwe to 91% in Madagascar and Uganda (Table 2). Mean proportion of net use by pregnant women across all countries in households with at least 1 ITN was 35%, compared with 79% among households with universal net coverage. Households with universal coverage had higher average bed net use among pregnant women than households with partial coverage: 79% vs. 35%, respectively. Net use was generally higher among pregnant women and non-pregnant WRA than among other household members. There was no significant difference in use between pregnant women and WRA in any country, regardless of whether the household had sufficient nets for the entire family. In households with at least 1 ITN, a significantly higher proportion of pregnant women than “other” household members (comprising children through 14 years of age, men ages 15–49 years, and adults over 49 years) used nets in 8 of the 10 countries included in the analysis (Liberia, Malawi, Mozambique, Nigeria, Rwanda, Senegal, Tanzania, and Uganda). In households with universal coverage, a significantly higher proportion of pregnant women than other household members used nets in Malawi, Rwanda, Senegal, Tanzania, and Uganda (Table 2). In all countries, the predicted probability of ITN use by pregnant women was significantly higher than the probability of ITN use by children ages 5–14, men ages 15–49, and individuals over 49 after controlling for other household variables. See, for example, Figure 1, showing data from Liberia. (For data from other countries, see Supplemental Figures 1–5). Pregnant women were also more likely to use an ITN than children under 5 in all but 4 countries (Nigeria, Senegal, Tanzania, and Zimbabwe). See Figure 2 for sample data from Senegal and Supplemental Figures 6–8 for data from Nigeria, Tanzania, and Zimbabwe. In all countries, ITN use by pregnant women was not significantly different than for non-pregnant WRA when controlling for other household variables. Abbreviations: ITN, insecticide-treated net; WRA, (non-pregnant) women of reproductive age. Pregnant women were significantly more likely to use an ITN than children under 5, children ages 5–14, men ages 15–49, and adults over 49 years. ITN use by pregnant women was not significantly different than use by non-pregnant WRA. Error bars indicate 95% confidence intervals. Pregnant women were significantly more likely to use an ITN than children ages 5–14, men ages 15–49, and adults over 49 years. ITN use by pregnant women was not significantly different than use by non-pregnant WRA or children under 5. Error bars indicate 95% confidence intervals. Pregnant women and non-pregnant women of reproductive age were significantly more likely to use a bed net than other household members. In this study, we compared ITN use by pregnant women in households with and without universal net coverage (that is, 1 net per 2 people) to determine whether lack of household access to ITNs was the main reason for non-use of nets by pregnant women. The results of this study demonstrate that across the 10 study countries, pregnant women as well as non-pregnant women of reproductive age were more likely to have used an ITN the night before the survey than other household members. In addition, an even higher proportion of pregnant women who lived in a household with universal coverage than pregnant women in households without universal coverage used nets. This suggests that both non-pregnant women of reproductive age and pregnant women are being prioritized within the household and that non-use is indeed more related to lack of access to an ITN rather than due to a behavioral issue. Lack of access to bed nets is an important barrier to use of nets by pregnant women. The upward trend has led to an overall increase in net use by pregnant women, which can be attributed to increased intra-household net access as well as prioritization of all women of reproductive age by those household members responsible for net use and allocation decisions. In some countries evaluated in this study, net use by pregnant women has exceeded RBM's 2010 goal of 80% use in households that report universal coverage.11,24 However, in households owning less than 1 net per 2 people, no countries met this goal. Insufficient access to nets for pregnant women can be due to many factors, including local- and national-level stockouts of ITNs at ANC clinics, delays in ANC attendance, and insufficient provider training.11,25 These problems call for additional monitoring and evaluation of the supply chain and accountability both nationally and locally as well as improving ANC distribution systems to ensure consistent access to nets by pregnant women. Supply chains for bed nets should be monitored to ensure consistent access to nets by pregnant women. One limitation of this study is that in some countries net ownership and use was so high that the difference in net use between pregnant and non-pregnant household members was too small to detect. In Tanzania, over 90% of households reported having at least 1 bed net, and 41% of households had at least 1 net for 2 people (Table 1). However, the difference in net use between pregnant and non-pregnant individuals was only 1%–2%. Although this could reflect lack of prioritization, it is more likely due to a long-standing targeted distribution program through ANC services, a recent universal coverage campaign, high net use, and a small sample size of pregnant women. Another limitation of this study is that net use was not stratified geographically within each country. It is known that net use varies regionally,26 but there were not enough data in this study to evaluate these differences. Lack of access to bed nets appears to be the more important factor for non-use of ITNs by pregnant women in the 10 African countries analyzed in this study, rather than behavioral issues. However, it would be premature to assume that increasing net access alone would solve the problem completely, particularly since shortages and gaps in coverage are inevitable at national and local levels. Strategies such as behavior change communication to promote prioritization of pregnant women at both national program and household levels are necessary to achieve the coverage goals set by RBM for pregnant women. Such strategies can increase pregnant women's access to ITNs, further strengthen the culture of net use in countries in general, and continue to encourage net use specifically by pregnant women at all stages of pregnancy. This work was supported by USAID under Cooperative Agreement #GHS-A-00-09-00014-00. We are grateful to the members of the PMI Malaria in Pregnancy Working Group for their direction and inputs on earlier drafts of this article.
. Recalculating the net use gap: a multi-country comparison of ITN use versus ITN access. PLoS One. Forthcoming 2014.